Selling tile plows and complementary precision farming technology has proven to be a lucrative niche market for some dealers, whether selling a complete system or retrofitting an older unit with newer components. In the realm of precision farming equipment, a slowdown in sales always seems to spur a search for alternative niche markets. 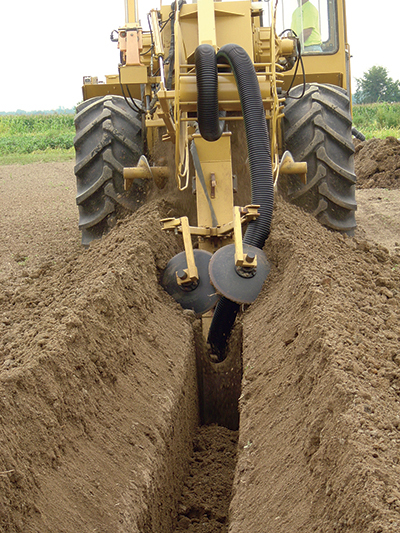 One such market that some dealers have been pursuing is tile plowing — selling new plows along with retrofitting older equipment with new precision components. Precision specialist, Chris Hoffmann of P&C Ag Solutions, a precision dealership in Reese, Mich., has been exploring this market for the better part of 5 years with solid results. Although Hoffmann has been pleased with the sales of the tile plows themselves, he sees a lot of opportunity in his area for precision upgrades and Ag Leader Intellislope controls. As big iron sales contract, many of his customers would still like access to the newest precision technology without having to buy all new equipment. Sales have varied from year to year, however, Hoffmann thinks the prospects for future sales are strong in his area. When it comes to getting the word out, Hoffmann says the most success they’ve had is reaching directly out to contractors. Part of the reason dealers have had success selling tile plows and GPS retrofits has been that local farmers seem to have a desire to own their own equipment rather than hiring the work out — especially for smaller jobs. Matt Culler, sales and service manager with Ag Info Tech in Mount Vernon, Ohio, has seen similar success since the precision dealership started bringing tile plow equipment to their customers in 2010. Getting into the business slowly made a big difference, Culler says. Since they hadn’t previously sold or handled tile plows or the related precision gear, they needed some time to familiarize themselves with the operation and troubleshooting that came with the equipment. Ag Info Tech now has about 10% of their total sales in tiling related equipment. Culler says part of the reason they’ve seen success with selling the tile plows and GPS retrofits has been that local farmers seem to have a desire to own their own equipment rather than hiring the work out — especially for smaller jobs. “I see opportunity in our area because there are still a lot of guys with big enough farms to justify owning their own plow,” says Culler. “Also, a lot of them have smaller jobs they want to get done, but it’s hard for them to get a custom guy to come out for anything less than 100 acres because it’s so expensive to move their machines. While Culler projects that the market for tile plow equipment in his area is still very strong, he’s already begun to branch out into tile plow related services as well.